Located just a few miles from Levanto in the small village of Chiesanuova, this 4-room sixteenth century inn is on the site of a building at which King Otto III is said to have stayed in AD 996 en route to his coronation in Rome. Fit & healthy romantics will no doubt be happy to learn that the place is inaccessible by car – a hundred metre walk is necessary – and that it affords some fine views across the Levanto Valley and across the Mediterranean. It offers just 4 suites, each of which is individually named and furnished: The Ottone III, Silvestro II, Teofano and the Adelaide. 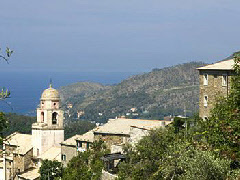 The town of La Spezia is just a few miles away, while Rapallo and Genoa are both within easy reach by car.